during qualifying for the Monster Energy NASCAR Cup Series Pennzoil 400 at Las Vegas Motor Speedway on March 1, 2019 in Las Vegas, Nevada. 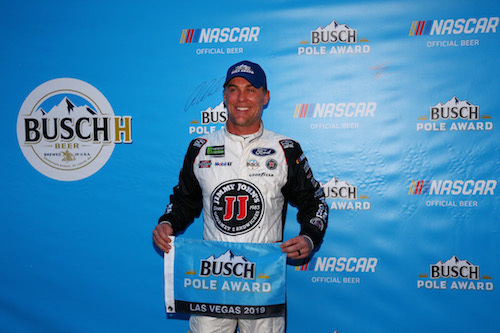 With a 29.914-second/180.517 mph lap in the third and final round of Monster Energy NASCAR Cup Series qualifying at Las Vegas Motor Speedway on Friday, Kevin Harvick won the pole for Sunday’s Pennzoil 400, the third race of the 2019 Cup Series season and the first will all components of the new 2019 aerodynamic rules package. Harvick will be joined on the front row by Denny Hamlin. Hamlin’s Joe Gibbs Racing teammate Kyle Busch qualified third and will share the second row with Austin Dillon. With the addition of aero ducts to the rules package for LVMS, Friday’s qualifying session included drafting. 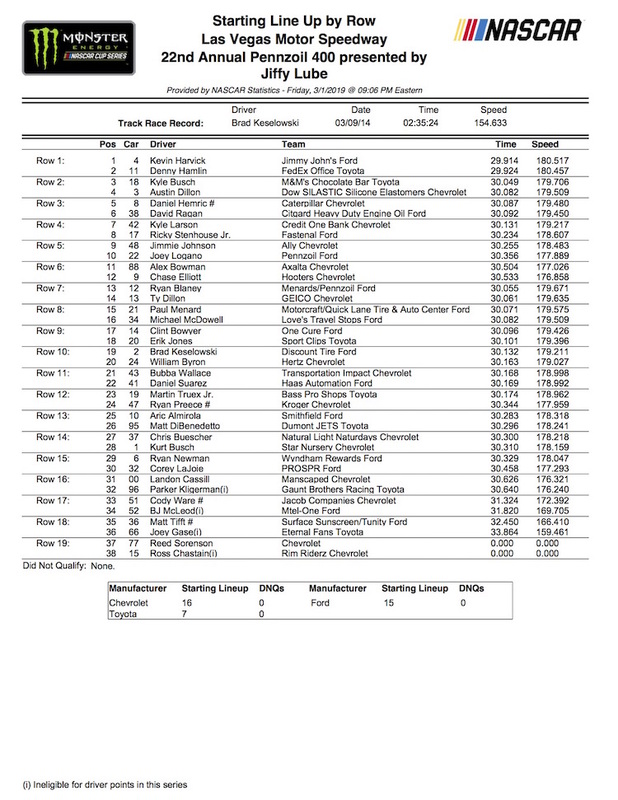 Hendrick Motorsports teammates Alex Bowman and Chase Elliott actually posted the two fastest laps of the third round on second and final attempt at timed laps but ran out of time for those laps to count. Instead, they wound up the final two in the round and 11th and 12th on the starting grid. After Richard Childress Racing teammates Dillon and Daniel Hemric turned in the fastest laps in the day’s lone practice session, Dillon also was fastest in the opening round of qualifying with a 30.006-second/179.964 mph lap. Both RCR drivers advanced to the third round of qualifying, and Hemric wound up fifth. Harvick was fastest in the second round of qualifying with a 29.814-second/181.123 mph lap, the fastest lap, overall, of the three-round qualifying session.